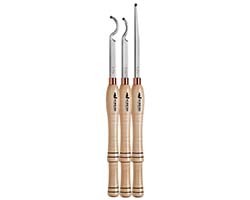 The right tool for the right job - great value, high quality turning. 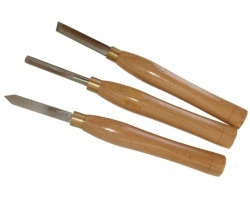 Easy Woodturning only requires our 3 easy to use Carbide Cutter Heads and there is a specific tool for each one. 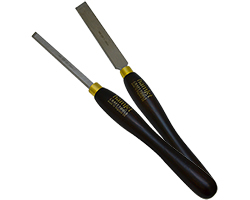 Each super sharp and long lasting cutter will make clean cuts on any material. You only need to hold the tools flat and level to get the same great results on spindles and bowls. Best tool for under-cutting hollow forms The Easy Hollower was designed to offer a revolutionary new approach to turning hollow forms. 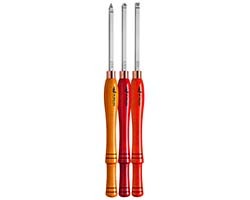 These patended tools allow any skill level to achieve professional results for hollowing work with minimum effort and worry. Available in four sizes. Technical Info: The Hollower tools are 100% CNC machined on all surfaces, except the bottom, from solid stainless steel plate (not bent round bar). Grade, Grind and Geometry. 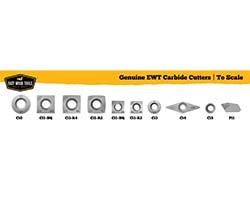 These are the 3 G's of the perfect Carbide Cutter. Thousands of man hours has been invested in finding the perfect combination of variables. It also shows the quality of the Cutters, the sharpness of the edges and the life you get from each one. 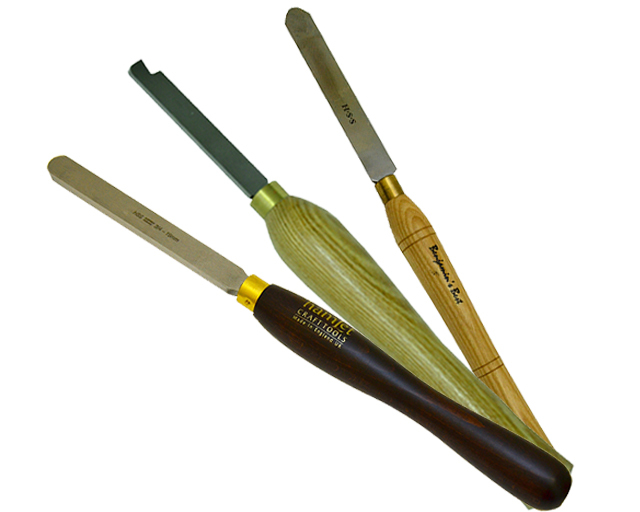 Roughing gouges are essential for every woodturner's tool box. 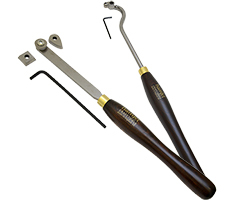 Typically the first tool to be used on every project to reduce the size and prepare your timber for finer turning. Used for roughing, slicing and shearing cuts on the outside of bowls, and for roughing and finishing on the inside of bowls. Usually ground to an angle between 55o and 65o according to user preference. 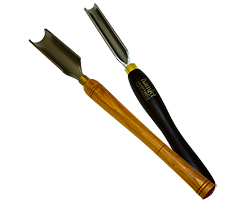 The skew chisel is the most versatile and invaluable tools for every turner. Almost exclusively used when turning spindles. It will plane, turn beads, make 'V' cuts, pummel cuts and turn long, shallow coves. 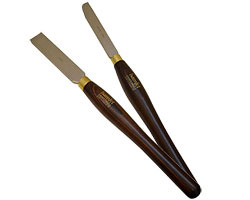 It can also be used to create dovetails for various chucking methods. It is available in many forms and sizes from micro to huge: 3mm (1/8in) to 38mm (1 1/2in). 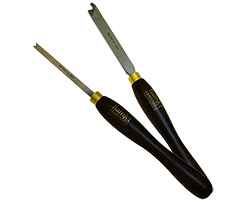 The parting tool is one of the most frequently used tools on the bench. Parting uses a blade-like cutting tool plunged directly into the workpiece to cut off the workpiece at a specific length. 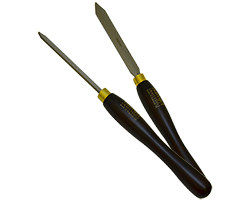 It is normally used to remove the finished end of a workpiece from the stock that is clamped in the chuck. 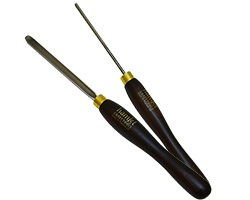 Captive ring tools are designed to help you produce that perfect captive ring. 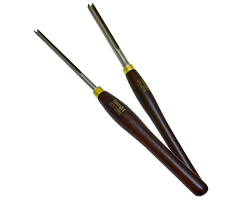 Bead forming tools make bead-cutting easy and consistent. If your project requires numerous rings to be cut, this tool will produce them quickly and consistently to produce a professional finish in good time.